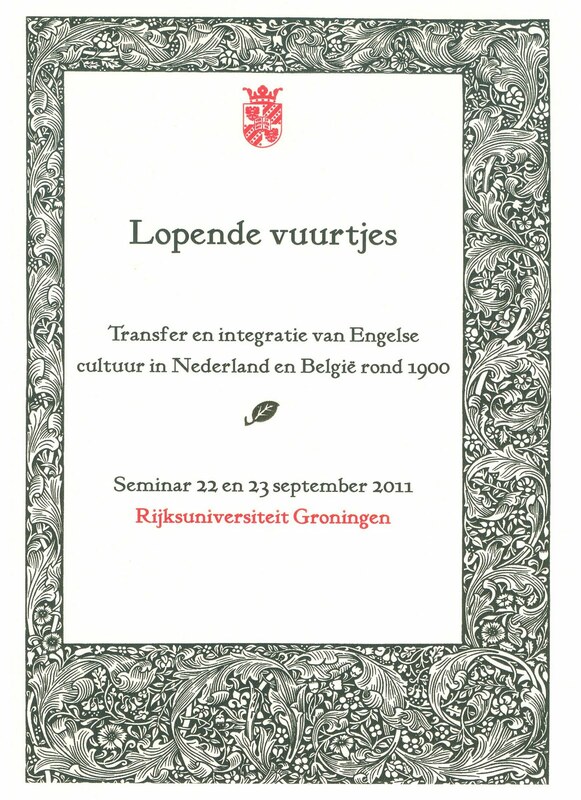 The University of Groningen is organizing a conference on the transfer and integration of English culture in the Netherlands and Belgium around 1900. 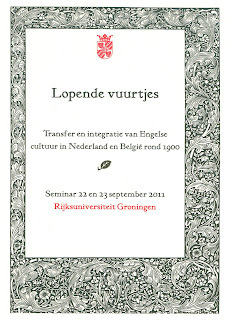 The seminar takes place from 22 to 23 September, see the website Lopende vuurtjes (Spreading like wildfire). The border on the front cover of the programme is taken from the most famous Kelmscott Press edition, The Works of Geoffrey Chaucer (1896, p. 9) and the two different ornaments that are used for the programme were copied after Morris's printer's flowers No. 1 and No. 2 (as described by William S. Peterson in A Bibliography of the Kelmscott Press, Oxford, Clarendon Press, 1985, reprint, p. xxxiii). Lieske Tibbe will talk about the relations between Dutch journalists and politicians, such as Leo Simons and Ferdinand Domela Nieuwenhuis, and William Morris. They had met Morris in London. The critics Jan Veth and Hermine Marius wrote about English art in several papers and magazines - there will be a talk about this subject by the organizer of the conference, Anne van Buul - but they did not write about Morris before his death in 1896 and his private press work was not well known in the Netherlands. 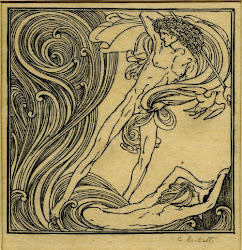 Veth advocated other artists, especially Charles Ricketts and Charles Shannon, and wrote long laudatory articles about their books (Daphnis and Chloe, Hero and Leander) and their magazine The Dial. The early Dutch praise for Ricketts and Shannon was summarized by J.G. Paul Delaney in his biography Charles Ricketts (Oxford, Clarendon Press, 1990, p. 91). Veth's articles led to a series of exhibitions containing their work and in 1895 Van Wisselingh's gallery in Amsterdam devoted an entire exhibition to Ricketts and Shannon - a recognition they had not yet experienced in England. 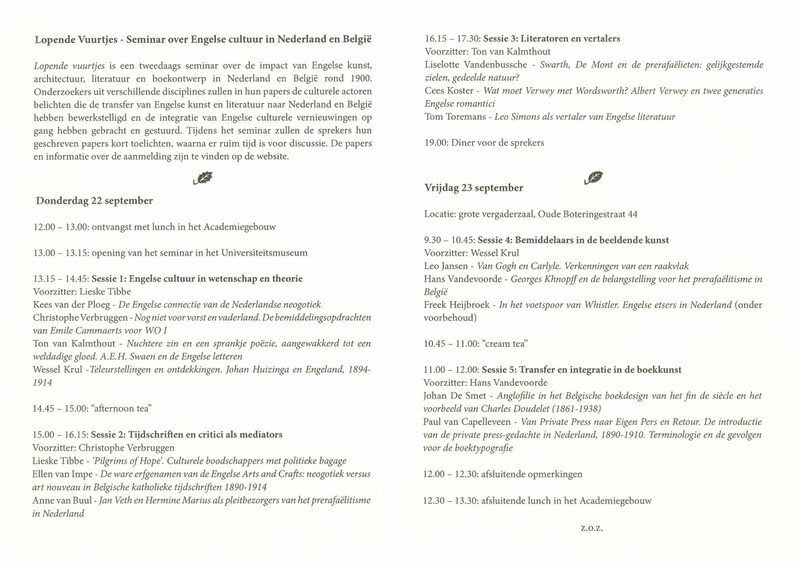 My talk at the Groningen seminar will mention Ricketts repeatedly. 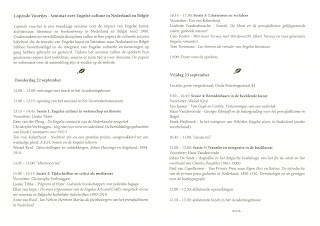 I will try to shed light on the slow transfer of the private press ideals to the Dutch book world.